There are few positions in sports that come with the same tradition as being a guard at Duke. For decades, Blue Devil guards have become one of college basketball’s most notorious fraternities. Known for knocking down big shots, hustling plays on the defensive end and the occasional vivacious floor slap, Duke teams across the years have been led by scrappy guards. They are adored by Blue Devil fans for their heart. Often times, they are maligned by the rest of the nation for the same reason—until that player becomes the head coach of their favorite team. In all, there were nine former Duke guards coaching in Division I programs this year. Seven of them coached in this year’s NCAA tournament, representing four different teams. Between them, these former Blue Devils have a combined 10 Final Four appearances, four national championships and 10 All-ACC selections. Duke head coach Mike Krzyzewski attributes the amount of responsibility he gives to his guards to the way he was coached during his collegiate career at Army by Hall of Famer Bobby Knight. All on-court accolades aside, what current Blue Devil associate head coach Jeff Capel, Trinity ’97, said was most important about this group was the fact that every single one of them served as a Duke captain during his collegiate career. The group has a combined 13 years of experienced captaining Blue Devil teams. The active role that Krzyzewski allows his captains to take on during their playing careers helps to make for an easy transition from the hardwood to the sidelines, added Capel—who played in the Duke backcourt from 1993 to 1997 and is best known for his 40-foot buzzer-beater against North Carolina. Duke's tradition of guards joining the coaching ranks was born out of Krzyzewski’s desire to allow his players to further their academic pursuits. The Hall of Fame head coach had a knack for leaving a graduate assistant position open for former players interested in pursuing coaching and earning an advanced degree. In 1987, Amaker had been selected in the third round of the NBA draft by the Seattle Supersonics. Undersized for an NBA guard, Amaker was cut from the team. 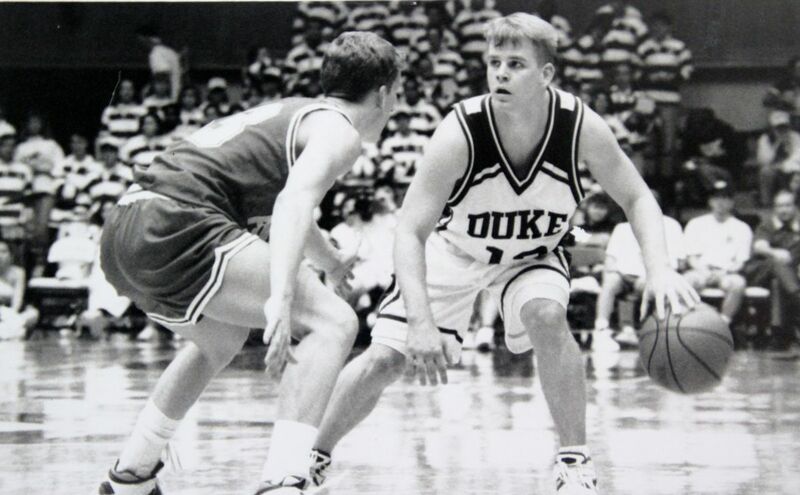 Less than a year later, the first-ever winner of the NABC Defensive Player of the Year award decided to take Krzyzewski up on his offer, joining the Blue Devil staff in 1988 and working on an MBA at the Fuqua School of Business. At the ripe old age of 23, Amaker was a member of the coaching staff that would lead Duke to the 1989 Final Four. Amaker had no previous coaching experience, but as a former Blue Devil point guard he knew the team’s system and personnel inside and out. That knowledge is what ultimately helped him transition into his role as a college basketball coach more than a decade before many of his peers across the nation landed their first coaching job. When he began his coaching career, Amaker was virtually the same age as the players he coached. Nearly all of them were his former teammates. Demanding respect from his close friends was difficult at first, he said, but allowed for more open lines of communication between the players and the coaching staff. Scheyer found himself in that same position during the 2013-14 season, his first as a special assistant. Although the nature of the 26-year-old’s position limited most of his responsibilities to conditioning work and limited roles in recruiting, he was forced to coach former teammate Andre Dawkins, first year Divinity student and Trinity ’13. Dawkins won Duke’s last national championship in 2010 alongside Scheyer. During his tenure with the Blue Devils, Amaker coached Capel, Collins, Hurley, James and Wojciechowski, all of whom would eventually make the same step across the sidelines that he did. All but James and Hurley joined the college coaching ranks before their 30th birthdays. So which former Blue Devil might be best-suited to fill the program’s next coaching vacancy when the time comes? Consensus is that it might be senior guard Tyler Thornton, whose Duke career ended with the team’s upset loss to Mercer March 21. Thornton did not announce any immediate plans for his basketball future, but indicated midway through conference play that a potential career in coaching has been on his mind this season. “That’s one thing I want to do later on in my career, once basketball is over,” Thornton said. Each former Duke guard took a different path to coaching. Wojciechowski did not waste much time before returning to Duke after graduation. Capel first coached for his father at Old Dominion and held multiple head coaching jobs before returning to the Blue Devils. Hurley worked in a number of NBA organizations as a scout. James played seven years overseas before taking a position at Duke. Johnny Dawkins spent a decade in the NBA before coming back to his alma mater. When Amaker earned his first head coaching job at Seton Hall, he brought on Collins as an assistant. Regardless of the path they took to reach the sidelines, Duke guards young and old—spanning three decades—are intertwined by an unbreakable bond. As the years progress, former Blue Devil guards are laying down roots at their own programs. Capel and Wojciechowski will likely be two of the most sought-after hires in college basketball’s coaching carousel this offseason. Just as Krzyzewski has pioneered a tradition of having young guards join his coaching staff, his former assistants have taken the tradition to their new programs. Amaker’s youngest assistant is 23-year-old Christian Webster, who became the all-time winningest player in Harvard basketball history last year. Separation by thousands of miles or by years between playing careers does not stop former Duke guards from supporting one another in the coaching profession. Former Blue Devils are constantly checking up on each other’s teams throughout the season and communicating via text message and Twitter. Although Duke bowed out in its first NCAA tournament game, former Blue Devils had a fair share of coaching success this March. Johhny Dawkins led his 10th-seeded Stanford Cardinal into the tournament’s second weekend for just the second time since 2001. In his seventh year coaching at Harvard, Amaker led his 12th-seeded Crimson to an upset of their own, knocking off Cincinnati before falling to Michigan State. Paulus was the victim of an upset himself, as the Ohio State assistant watched his sixth-seeded Buckeyes fall to No. 11 seed Dayton in their first tournament game. As a first-year head coach, Hurley led Buffalo to a 19-10 record as the Bulls finished in first place in the Mid-American Conference’s Eastern Division. Collins, who left the Duke staff last offseason to take a head coaching job at Northwestern, saw his Widcats struggle to a 14-19 record but scored an upset win in the first round of the Big Ten tournament. Although everything is friendly between these nine former Duke players on the sidelines, no love would be lost on the hardwood. When asked whether or not the Blue Devil coaching staff could be beaten in a game of four-on-four by any other coaching staff in the country, Hurley let the competitive fire he became known for during his playing career show. Amaker was less resistant to the idea that Wojciechowski, Capel, James and Scheyer could make as lethal of a combination on the court as they do off the court. * All were Trinity students. Amaker ’87, Collins ’96, Johnny Dawkins ’86, Hurley ’93, James ’01, Paulus ’09, Scheyer ’10, Wojciechowski ’98.